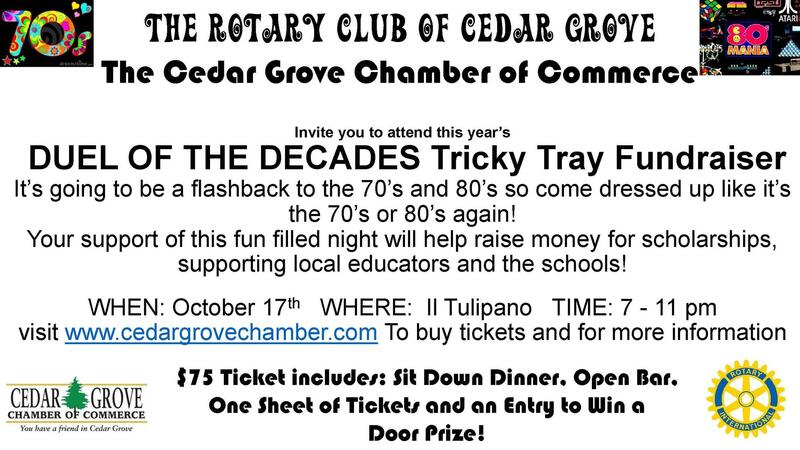 The Rotary Club of Cedar Grove and the Cedar Grove Chamber of Commerce are hosting a Duel of the Decades 70s vs 80s Tricky Tray on October 17th at Il Tulipano! Join us for a fun filled night! Come dressed up like it's the 70s or 80s again. Your support will help raise money for scholarships, supporting local educators and the schools. Buy your ticket now https://events.r20.constantcontact.com/register/eventReg?oeidk=a07eehfmr5n8dd86861&oseq=&c=&ch= . Tickets includes sit down dinner, open bar, a sheet of tickets, and entry to win a door prize. Gifts includes Disney Hopper passes, Cancun, Antigua, and Panama vacations, Woodhouse Spa, Raymond's restaurant in Montclair, Esposito's restaurant in Cedar Grove, Manicures, Kyoto III, hair salons, Tito's Vodka, Laura Mercier, and so much more. If you would like to donate or sponsor please contact us. Check out facebook for updates! @rotaryclubofcedargrove or @cedargrovechamber We hope to see you there!